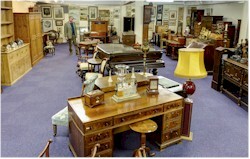 Bearnes Hampton & Littlewood has a large saleroom complex in Exeter, which is the capital not only of Devon but also of the South West of England. Fine art auctions are held weekly together with larger specialist sales being offered periodically. Our saleroom site in Exeter serves the West Country and is easily accessible from the rest of the United Kingdom by road (M5 and A30) and by rail (with Exeter St David's, Exeter Central and Exeter St Thomas stations only minutes away from our auction rooms). Exeter also benefits from easy access by air from many destinations in Europe to Exeter International Airport. Our Okehampton Street saleroom site (in Exeter, Devon) was purpose-built in the shell of an old paper mill in the city. It was extended considerably in late 2013 to form a large saleroom complex serving the South West.